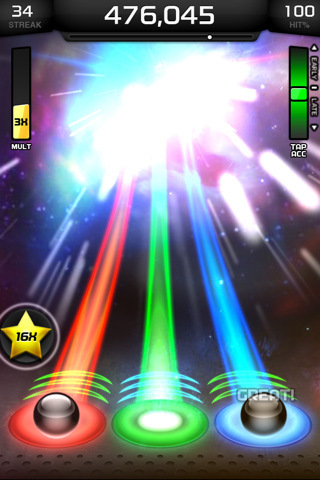 Tap Tap Revenge is the longest-running, most-downloaded music gaming app of ALL TIME just got a brand-new UPGRADE - it’s the biggest, baddest, most mind-blowing version yet! 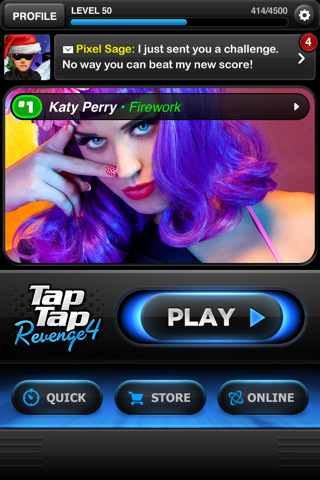 Tap and shake to the music of your favorite artists like Metallica, Lady Gaga, Ke$ha, Taio Cruz, Jason Derülo, and more! With a huge library of today’s biggest hits, plus over 100 FREE TRACKS, Tap Tap Revenge is the most addictive, adrenaline filled game in the App Store! LINKIN PARK’S latest smash “Waiting For The End,” plus “Sing,” the new single from MY CHEMICAL ROMANCE, and “House Music” by BENNY BENASSI come bundled with the download. Nelly, Katy Perry, Far East Movement, Nicki Minaj, Selena Gomez, Linkin Park, My Chemical Romance, Benny Benassi, and more! They join our most popular tracks Rihanna, Katy Perry, Bruno Mars, B.o.B., Owl City, The Killers, Fall Out Boy, No Doubt, Mike Posner, P!nk, Megadeth, Tiesto, Avenged Sevenfold, Blink-182, and hundreds of other premium and free songs! 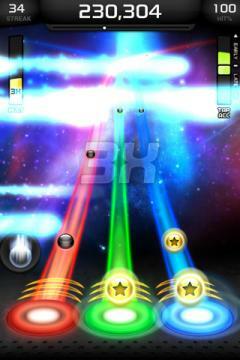 Tap Tap Revenge 4 is easy to learn, but takes a lifetime to master. Simply tap the targets on your touchscreen to the beat of the music, scoring points for accuracy and timing. Add in multiple difficulty levels, hundreds of available songs, and live online battlegrounds, and you’ll never have the same experience twice. Tap and shake to your favorite music from Glee!